Get some retro Roy for Christmas! Once upon a time, Christmas wasn't Christmas unless you got something with Roy of the Rovers on it in your stocking - and we're bringing those days back! 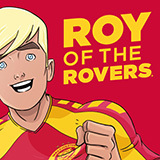 We're teamed up with the good folks at Calendar Club to create an exclusive 2019 Classic Roy of the Rovers calendar, featuring legendary covers from the comic's incredible run in the '70s and '80s.